While there are a number of different web analytics packages available on the market, from free (piwik.com) to more costly (Omniture and Adobe’s marketing cloud) Google Analytics seems to dominate the market by both being free and very well known. 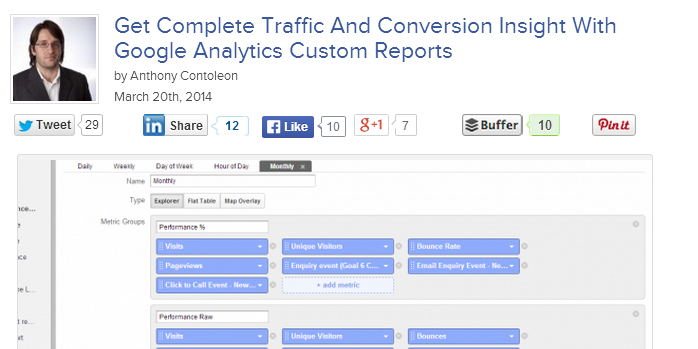 My post “Get Complete Traffic And Conversion Insight With Google Analytics Custom Reports” on Search Engine People has a brief look at a number of ways to create custom reports to take your analysis further. For a free tool, Google Analytics is excessively flexible. It provides fairly robust tracking for websites and mobile apps, can be customised to support cross domain tracking, events, goals and custom variables, and comes with a pretty good set of default reports. Google Analytics provides reporting and supports data based decision making for countless businesses and professionals. Given how many use cases Google Analytics has to cover, it should not be too surprising that the default reports are often just “pretty good” and not “perfect”. Read the full article on Search Engine People here.